Arms & Badges: History, Heraldry & Community! Our family database has history and heraldry on 6,350 families! Come join the Motley fools discussion! Jesters court is now in session! Arms & Badges is dedicated to providing information and products pertaining to Family Coat of Arms, Clan Badges, History and Heraldry information. We offer many web based community tools such as chat, forums, journals and news information that is focused on Medieval and Celtic themes. We hope you will bookmark our site as a resource of ever expanding information. Thanks for visiting and please return again! Heraldry in its most general sense encompasses all matters relating to the duties and responsibilities of officers of arms. To most, though, heraldry is the practice of designing, displaying, describing, and recording coats of arms and badges. Historically, it has been variously described as the shorthand of history (Fox-Davies) and the floral border in the garden of history (Moncreiffe & Pottinger). The origins of heraldry lie in the need to distinguish participants in combat when their faces were hidden by iron and steel helmets. 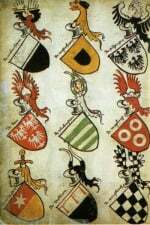 Eventually a system of rules developed into the modern form of heraldry. The latest News From Arms & Badges! Our family Coat of Arms has been expanded to over 35,000 surnames. Check out our new Celtic Radio Store containing a wealth of new heraldry products. Our online game called 'Medieval Kingdom' has gone live! Any suggestions please let us know! The latest products from our store! Our Country Database has history and heraldry on 11 countries! Cornwall (Cornish: Kernow or occasionally Curnow) is a county of England's south-west peninsula, lying west of the River Tamar.